The state of Alaska on Tuesday filed a lawsuit against the drug manufacturer Purdue Pharma that squarely blames the maker of OxyContin for stoking the state's opioid epidemic with deceptive marketing practices that led doctors to over-prescribe prescription painkillers and Alaskans to become addicted to them, with disastrous consequences. The lawsuit, filed in Anchorage Superior Court on Tuesday, claims Purdue Pharma violated state consumer protection law with years of aggressive and misleading marketing that minimized the risk of addiction in pursuit of profit. Opioids have had a direct impact on the lives of many Alaskans, Gov. Bill Walker in a statement released Tuesday. "We have people becoming criminals to feed their habits. We have grandparents having to take care of grandchildren because the parents have fallen into the spiral of addiction or worse, have died from an overdose," Walker said. "And the worst part is a lot of these people would have never become addicts without that initial prescription that went on too long." Alaska joins at least 11 states that have sued Purdue Pharma over opioids. Washington state sued the company in September. New Jersey on Tuesday also filed suit against the company, which responded in a statement saying it is "deeply troubled by the opioid crisis and we are dedicated to being part of the solution." "We vigorously deny these allegations and look forward to the opportunity to present our defense," Purdue Pharma said in an e-mailed statement Tuesday. "We are deeply troubled by the opioid crisis and we are dedicated to being part of the solution," the statement said. "As a company grounded in science, we must balance patient access to FDA-approved medicines, while working collaboratively to solve this public health challenge." The company also said that its products account for only 2 percent of total opioid prescriptions. The state is seeking restitution or reimbursement of money spent dealing with the fallout of addiction, Franklin said. The state of Alaska is contracting on a contingency basis with Motley Rice, the same South Carolina-based law firm that sued Purdue Pharma on behalf of New Hampshire and South Carolina, for the legal work. The state is spending the time and resources to sue the drug company because Purdue Pharma broke Alaska's strong consumer protection laws and should pay to help clean up the mess left behind, said Cynthia Franklin, an assistant attorney general in the Department of Law's consumer protection division. "We're in a situation that was to some extent created by a company seeking profit," Franklin said. "If your product creates a health crisis you should share in the cleanup cost of that crisis." The state is singling out Purdue Pharma in part because an investigation into Medicaid spending showed OxyContin was by far the most prescribed name-brand painkiller in Alaska, Franklin said. "They've got the market share in Alaska," she said. 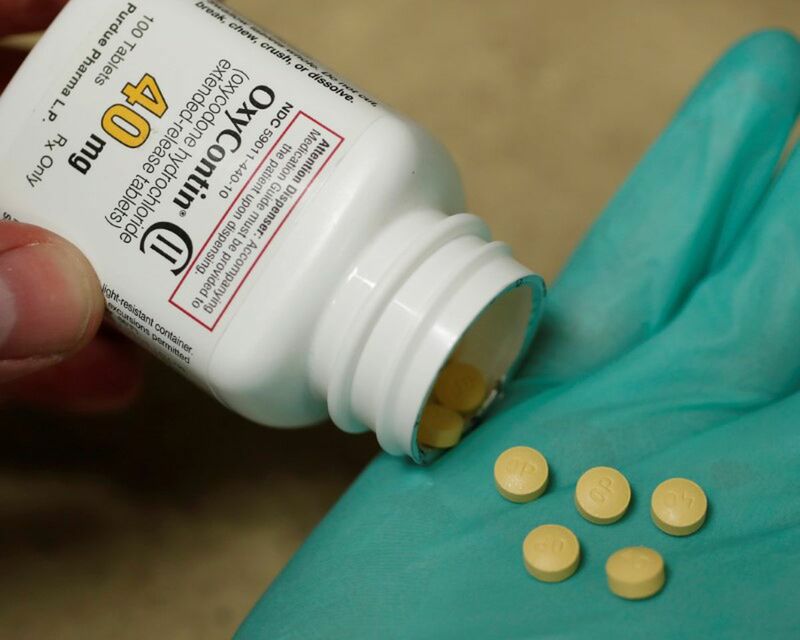 Purdue drugs made up 95 percent of the brand-name opioids paid for by Alaska's Medicaid program between 2013 and 2016, the lawsuit says. The state spent over $25 million on Purdue drugs from 2009 to 2017. The lawsuit is the result of a monthslong investigation into Purdue Pharma's history in Alaska. It describes sales reps aggressively courting doctors in Alaska to prescribe painkillers for years. Sales reps had an "astonishing footprint" in the state, the lawsuit said. "Doctors from across Alaska describe their Purdue representative's visits as 'relentless' and 'like clockwork' every six weeks or two months," the complaint says. The complaint alleges that Purdue Pharma knew "a small set of doctors were responsible for the vast majority of sales" in Alaska, with a handful of doctors making up half Purdue's revenue in the state. Just three prescribers "each billed over $1 million dollars in Purdue opioids." Only one high-volume prescriber is named in the lawsuit: Dr. Mahmood Ahmad, who lost his medical license in 2016 after the state medical board investigated his opioid prescribing practices. Over one three-day period, Ahmad wrote 229 prescriptions for controlled substances, and was known for seeing lots of patients who paid in cash, in short appointments scheduled every 15 minutes, according to the medical board's investigation. The lawsuit claims Purdue knew how much he was prescribing but never reported him – or any other provider – to state authorities. The scope of the OxyContin prescription uncovered by the investigation was stunning, Franklin said. Virtually all of Purdue's income from Medicaid payments came from patients who were prescribed an opioid for more than 90 days. "To me, one of the most amazing things was the length of time Alaskans are taking opioids," Franklin said. "When I saw the numbers around how much Medicaid money we're spending for people to stay on opioids for a really long time, I was shocked by that." The lawsuit also describes the impact of widespread prescription on some remote Alaska communities, and how the state says painkiller use led directly to heroin for some. One nonprofit serving small towns from Whittier to Adak stopped prescribing opioids for chronic pain because of overprescribing and theft. "When pills were not available, those who were introduced to opioids by their doctors turned to heroin, which was previously unknown in these communities," the lawsuit said. "This year, syringes have been turning up in villages of 40 residents." Parts of the complaint are redacted because some of the information is subject to confidentiality through the consumer protection act, Franklin said. Purdue Pharma has not yet responded to the lawsuit. On its website, the company says it is working with policymakers and health experts to reduce the risks involving opioids. "Purdue is acutely aware of the public health risks these medications create, especially when they are abused or misused," it says. "Pharmaceutical companies, including Purdue, are developing innovative technologies to create opioid medications in new forms that are more difficult to manipulate, and so are less gratifying to abusers."